" I made the mistake of attending dinner that evening. I was placed beside Mr Morris, William, looking ill at ease, and Miss Rossetti, who spoke past me for the most part, eager to converse with William about poetry and his new novel. This was engaging a great deal of his time, and no doubt giving him great reason to hide away. Rossetti sat between his mother and Jane, speaking to his mother the most and giving Jane looks of devotion which she paid no attention to. I ate well, soup, meat and a fruit pudding, but remained quiet in the midst of the conversation, as Jane did. 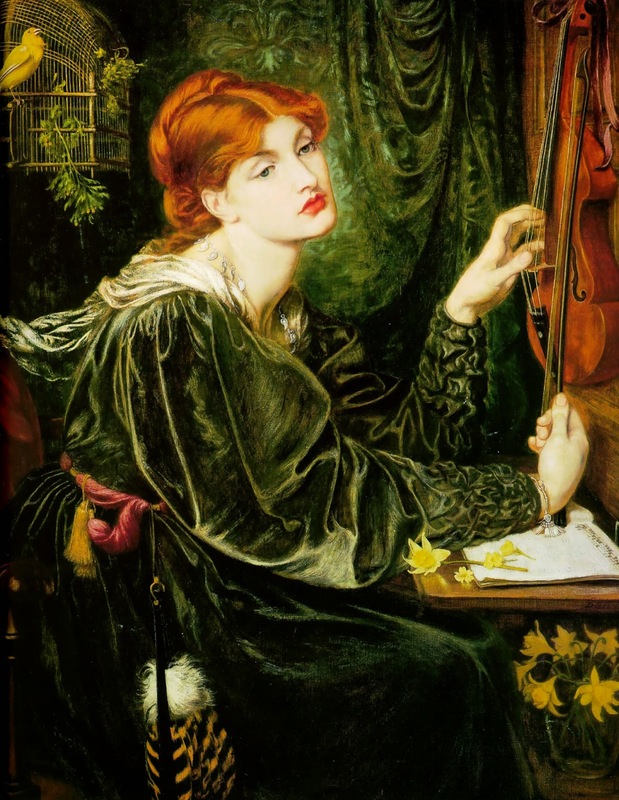 To her credit, the crow-like Miss Rossetti engaged me in conversation about the area of London I came from, then about St Paul’s Cathedral, which I knew very little about other than its general appearance. She smiled and spoke pleasantly, if a little like she felt it was a duty. She had the professional air of someone who found it a pleasant challenge to talk to all manner of people. I wondered if she did prison visits. Her manner was serious, but interested and she was skilful at drawing questions from my responses. I explained that my uncle ran a meat market stall. She asked about the expense of cuts, the preference of animal at different times of year, the best cut of meat. I replied to her question about my work that I had worked as a seamstress, and she asked if I knew embroidery, of which I knew a little, which caused a nod of pleasure from both her and Mr Morris. At the end of the meal, I excused myself so I could pack and wished the Rossetti ladies a good evening. I had gone through to the room beyond and paused, catching sight of a sketch left on the chair. It was of May, looking angelic, and I paused, smiling. ‘She seems pleasant.’ Mrs Rossetti’s voice carried through to me, and there was a general chuckle from the assembled party. ‘Did you think I employed savages to pose?’ Her son’s reply was full of mischief. There was a moment of good-natured murmuring at the table, as William and Christina both seemed to speak and laugh, then Rossetti spoke again, his voice tight with jollity. A great laugh of indignation arose from the party, laughter at me, poor stupid me and Rossetti’s cruelness in pointing out my folly. I turned to leave and saw May, crouched on the stairs, her smile like a contented cat. I didn’t linger." For the oils, the clear winner was Veronica Veronese, followed by Monna Vanna and La Ghirlandata tied in second place. I think it is the glorious green, copper and yellow all clashing and combining to such spectacular effect. Coincidentally, this is the only image they have of Alexa in the shop at Kelmscott. It's on a fridge magnet and therefore now on my fridge. Lots of you loved this one and it's easy to see why. 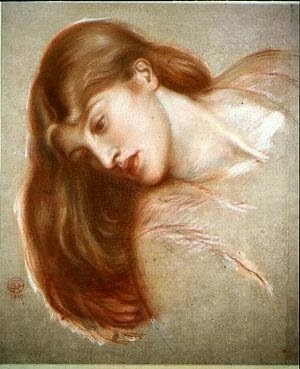 Rossetti was an absolute genius with chalk. That tumble of russety hair is divine. So, Freyalyn, if you could drop me a line to my email with your address I shall pop a signed copy off to you! Thank you again to you all for making the publication of my first novel such fun and larks, I couldn't have done it without all your support. YAY! I am so glad the Veronese won! I get to visit her at the Delaware a couple of times a month. Not so amazing perhaps as all the places you get to go, but the Bancroft Collection is as close to church as I am ever likely to experience. I am eager to read your book. There is precious little out there on Miss Wilding, and your work will be happily received. Where can I find it? ha! just got it on amazon. squee! Well I'm off to my local Amazon to buy the book. Eep - that's me! I have just sent you an email with my address, and am so, so pleased. Thank you very much indeed! Can't wait to read it! Congratulatons! Oh how wonderful! It's in my cart! Can't wait to read it. Hugs! !